As you may have guessed from my relative reticence, the last weeks and months have been particularly busy. In the last six weeks (since, roughly April 15th), I’ve travelled to Shanghai, Chicago, Phuket, Boulder, Singapore, a tropical island in Indonesia, Cape Cod, and Michigan. I’ve camped the Nor Cal woods with my fiancée, snorkeled Southeast Asian waters, and taken a beer tour of Chicago. I’ve attended offsites, retreats, annual meetings, and trainings. I’ve coached former classmates on storytelling, tried a new recipe for gluten-free/dairy-free mac and cheese, and volunteered at the soup kitchen. On the home front, we’ve replaced our washer and dryer, fixed the ice tray in the fridge (shockingly complicated), and replanted the front bed. For the wedding, we’ve ordered and addressed wedding invitations, finalized plans for cake, and completed the final fitting for my wedding dress. Most importantly, though, I’ve spent time with so many people I love around the world, including a few walks around the block with Reese, some quality time with Liz, and a beautiful bridal shower with nearly every member of my extended family. Second, I want to encourage real conversations. We often ask each other “How are you doing?” in a ritualized way, not expecting a full answer. It’s easy to answer “I’m busy” and sharing your schedule. When someone asks me how I’m doing, I aspire to respond to those questions with a better answer – one that goes a bit deeper or shares a bit more. Why am I busy? What is happening in the world as a result of my efforts? What is meaningful about that? Which brings us to the third and most important reason: I want to put attention on the underlying meaning, not the superficial hum of the activity. 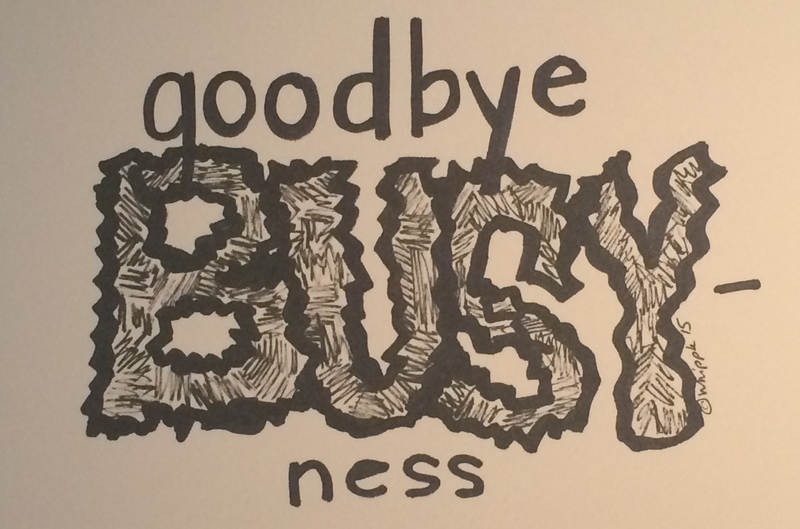 Ultimately, the word ‘busy’ doesn’t encapsulate the meaning behind it all. We all choose to sign ourselves up for work and activities, for life and relationships. We choose the things that make us so busy – and we presumably choose them because they’re important to us in some way. Being “busy” doesn’t invoke that overarching purpose in the activity; it just implies activity – and perhaps too much of it. Yet when I look at the litany of life in my first paragraph, I don’t feel exhausted, I feel exhilarated. Sure, I’m sometimes overtravelled, sometimes overworked, sometimes overstretched. But my underlying feeling here is one of satisfying fullness, and not of meaningless busy-ness. Therefore, that’s my new word: instead of saying “I’m busy,” I am going to say “I’m full.” I am full of activity, full of life, and full of meaning. In many contexts, to be full is to be complete. I want the fullness that comes with having my time and talents used completely towards my ambitions. Goodbye busy-ness. Welcome to fullness.